Recently bought Water Brushes with Ink for my Monday Figure Drawing classes. Really struggling to control the weight of each stroke, but it’s great for thinking about volume and shadows. The fastest and easiest way to change your perspective and habitual drawing style is to switch mediums. So if you’re stuck or having a bad art day, don’t give up – just switch from a pen to a paint brush. I am currently at Starbucks in Chagrin Falls, Ohio with my sister (who is drinking Camomille Tea and reading Outliers by Malcolm Gladwell). I really believe this coming year is going to be a good one … after all, I’ve just been gifted a notebook full of shades and hues. Every page forward is a new burst of inspiration that starts with a new Pantone colour. Pantone’s ‘Solar Power’ Yellow and a bit of figure drawing. 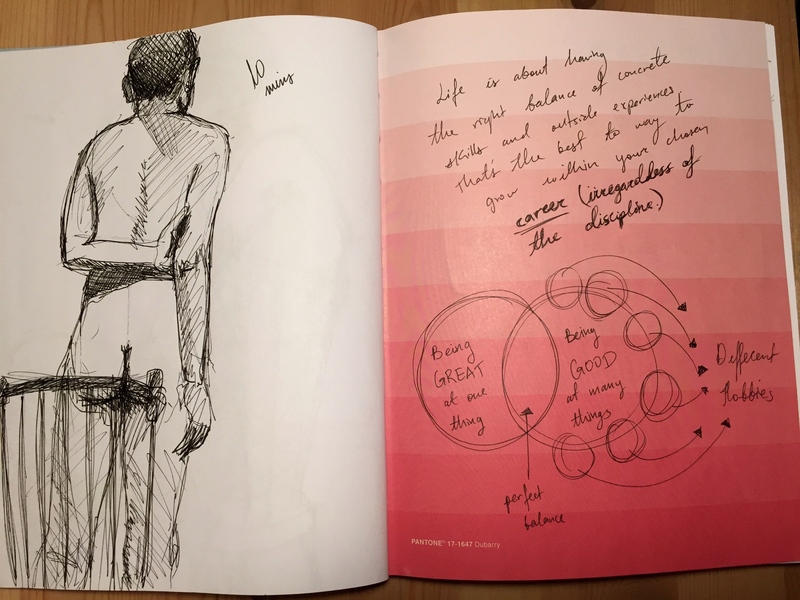 I’ve been putting my new Pantone book to good use with weekly figure drawing classes and random thoughts. The more I use it, the more I appreciate Pantone as a company and brand. 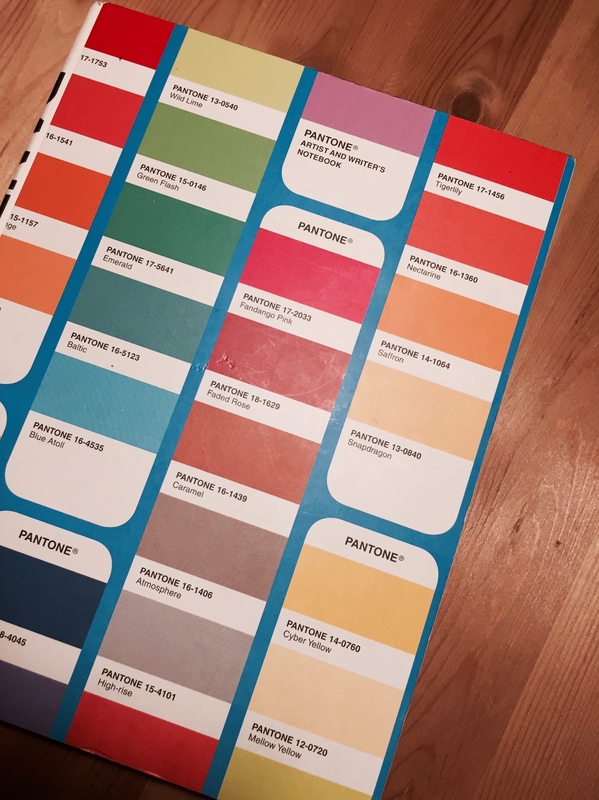 Their standardisation of colours is essential for printed graphic design work. But the best part (as with lipstick and nail polish), is the different names of the colours… from ‘high-rise’ to ‘Snapdragon’ to ‘Fandango Pink.’ I think my new dream job is: CORPORATE COLOUR NAMER. I updated the Figure Drawing Gallery on website: CLICK HERE. Also, now that I work in digital advertising, I’m going to place a tracking pixel on my website and track the Google Analytics. Let’s see who’s bopping about villyfriends.com! More than likely, you’ve never heard of the UPA (United Productions of America) … AKA the Animation Studio that opposed the Disney Style from the 1940s to the 1970s. There was an exodus of animators from the Disney Studio in the early 40s that lead to the foundation of UPA. This is a colour storyboard from one of their most famous films, The Unicorn in the Garden (1953). 1. The backgrounds were usually kept plain and minimal. 2. The movements were exaggerated and caricatured. 3. The colour could bled outside the outlines. 4. Every director was allowed to create a different style for their short film. Click on the picture to watch The Unicorn in the Garden.